Jack Daniel’s Tennessee Whiskey Coffee is a unique blend of gourmet coffee, 100% Arabica, infused with authentic Jack Daniel’s Tennessee Whiskey, and roasted medium to provide a full-bodied rich flavor. The distinct caramel and vanilla notes of Jack Daniel’s Old No. 7 Tennessee Whiskey are evident in each sip. Jack Daniel’s Coffee is sold as ground coffee, available in regular and decaffeinated, and packaged in 8.8oz collectible tins and 1.5oz gift bags. Jack Daniel’s Tennessee Whiskey Coffee is roasted and manufactured by World of Coffee, Inc. a family-owned custom specialty coffee roaster specializing in premium, high-end, great tasting, gourmet coffees. Roast masters since 1984, World of Coffee adheres to strict quality standards in the sourcing and production of the best tasting coffee. World of Coffee is certified Kosher by OK Kosher for all of its products, including Jack Daniel’s Tennessee Whiskey Coffee. 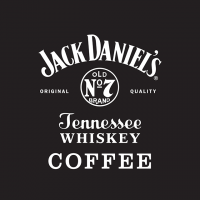 The Jack Daniel’s Tennessee Whiskey brand name and trademark are used under license from Jack Daniel’s Properties, Inc., with exclusive use for coffee.